One of the most common questions we are asked at Fluent Architectural Design Services Ltd is, when completing a house extension, will the space created be dark or will the rooms within the original house no longer gain much needed light? It is something that we are keen to avoid as light has become such an important factor in our lives. There are so many examples of property extensions that have taken place where this point wasn’t considered, maybe due to the client not having any previous experience in this field, the architect producing plans without considering it or the Local Authority adding restrictions in the design. It is so important to look to ways to get light into your home and adding an extension to your home should be a great opportunity to do this. It seems more and more of our clients are now able to work from home, British summers are starting to feel like how I remember summer’s as a child. Who wants to be spending time working at home in a cave? Surely that’s one of the reasons we work at home, get away from the constraints of our box we call an office, try and enjoy the sun when it’s there. You don’t want to extend your kitchen and be left with a dark gloomy space. Make sure you look into some of these solutions below so that when you extend your house, you have a space you can enjoy with friends and family and create something you can be proud of. 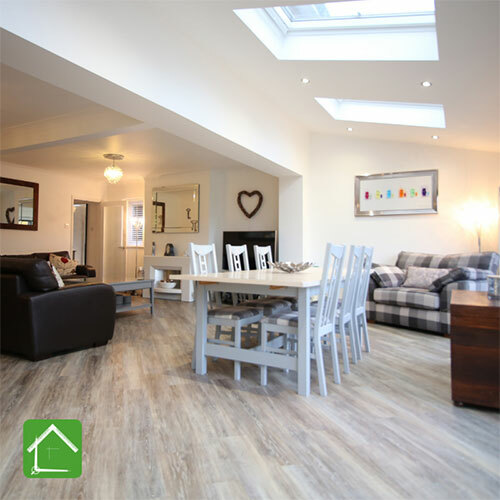 If you’re extending your home and want to create a new kitchen or family space, then a great alternative to a flat roof extension is to create a gabled pitch roof. This not only allows you to vault the ceiling and gain additional height and feeling of space, but large glazing can be added into the gable. This is a fantastic way to get additional glazing into your extension and an opportunity to add that Wow to your space. It is also a great way to add an extension to a traditional period home without it looking like an extension or out of place. The use of large glazed panels also fits perfectly when trying to add a modern twist to your property. One of the most cost-effective extension styles is a flat roof extension to the rear of your property. The danger with these is that the space which was at the rear of the house is now in the center of the house. 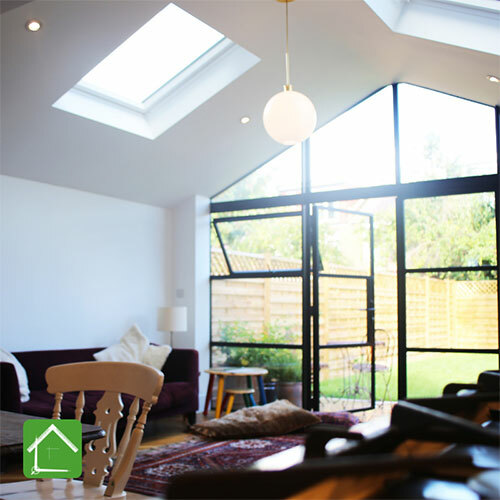 A great way to send light back into this part of your home is to add a roof lantern. On a contemporary style extension, a flat roof lantern can look slick and blend in to the clean straight lines of the extension, a vaulted roof lantern on a period property can create that Orangery look and add some additional height to the extension making the space immediately feel larger and brighter. 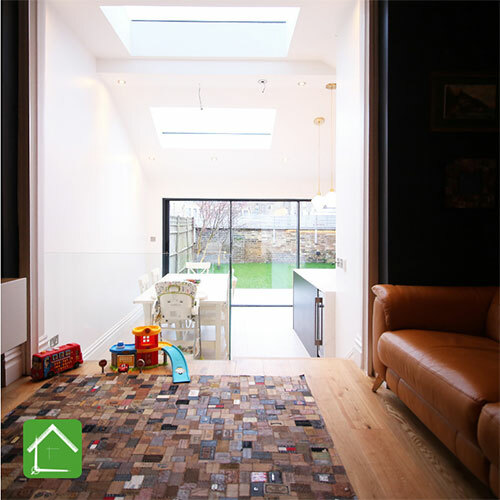 It is tempting to add the roof light to the center of the extension but consider pushing it closer to the original rear wall of the house to throw as much light as possible into your home. With larger bi-folding and sliding doors being installed your extension is going to gain plenty of natural light from the rear so don’t forget about that space being created in the center of your home. One of the more cost-effective ways to get light into your home is to use roof lights. Companies such as Velux have a large range of roof lights. Whether they’re fixed, openable or electric, you don’t have to blow your budget or drastically increase the cost per square meter of your build. Much like the roof lantern careful consideration must be placed on the location in the roof slope of the roof light. I would suggest trying to create some symmetry with their placing unless you have an asymmetric roof where you can have a little more fun exploring the size and shape of the roof lights. If you have decided to reduce costs or lower the height of your extension with a flat roof, all is not lost. Either a pitched mount can be installed, to allow the roof lights to be installed, or Velux also has a range of flat roof lights which looks great and gets much needed light into your home. 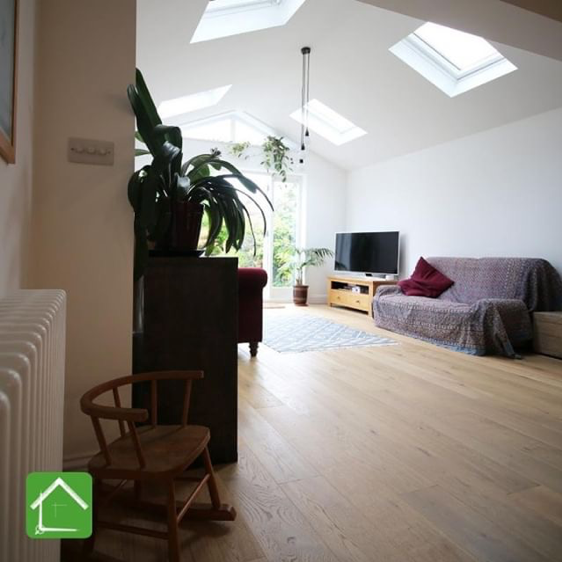 A roof light in a pitched roof will, in general let, in twice as much light than a traditional window. If you are considering a pitched roof, I cannot recommend enough to opt for a vaulted ceiling. This rather than having a flat ceiling in your extension, is to open the space and follow the line of your extension roof. Not only does it make a drastic difference to the amount of light that comes into your extension, it will also gain you some extra height making the space feel larger and more open. There can be some additional costs with this design but make sure you raise this option with your builder as sometimes it can be overlooked, and it is far more cost effective to do this during the build rather than attempting to do it at a later stage. If you have already got planning permission in place and this hasn’t been factored into the design, as this feature is internal and will not change the external appearance of your extension, making this change will not affect your permission. On some properties, no matter what you try you will struggle to get light into those hard to reach spaces. We have worked on a number of Victorian homes with large long rooms that, when extended, leaves the space in the middle of the house dark. You can spend a fortune on roof lights and lanterns and you just can’t brighten up these spaces. One solution is to place a downstairs toilet or use this space to create a utility room. If, however, these aren’t an option for you one solution that can work brilliantly is internal glazing. I have had consultations in client’s living rooms that have benefitted hugely from the large windows to the front elevation but gone into the kitchen which has been in darkness. If a high-level window had been placed in the rear wall of the living room, or a glass block wall been installed, then the light entering from the front of the house could have reached other parts of the property. A traditional window installed in an internal wall with exposed brickwork can create a great feature but also allow light to pass from one room to another. You could install some internal doors with glazing allowing one room to be opened into another when entertaining or closed off when you need some privacy. If you are considering extending your home, or want some advice on what is possible, please contact Fluent Architectural Design Services Ltd where a member of the team is waiting to help transform your home.